One year ago, a grand jury failed to indict NYPD officer Daniel Pantaleo for the killing of my father, Eric Garner. As I contemplate this past year -- a year full of upheaval and struggles for justice -- I'm struck by what has changed: nothing. Sure, New York Governor Andrew Cuomo appointed a special prosecutor to investigate police-related killings after my father's death. What's the likelihood that this appointment -- which only lasts one year -- will be renewed by the Republican controlled state legislature? Sure, Pantaleo, the officer who choked my father to death, had to appear before a grand jury, but Staten Island's then District Attorney Daniel Donovan gave immunity to the other officers involved. And where is Donovan now? Congress. This is the part that hurts the most: New York law outlines at least two ways the sitting District Attorney can reconvene a grand jury, but the new Staten Island DA, Democrat Michael McMahon, won't do it. McMahon received and accepted the endorsement of Police Benevolent Association President Pat Lynch. As if that weren't enough, the first Black City Councilwoman from Staten Island, Debbie Rose, endorsed McMahon even after Lynch threw support his way. Then there are the denied Freedom of Information Law (FOIL) requests I submitted in my desperate search for justice. I only wanted to know Daniel Pantaleo's disciplinary history, but I was flat-out denied requests to view the record of my so-called public servant. Now I know he will never see trial, or jail, or any discipline at all. I think of Laquan McDonald, Emmett Till, Mike Brown and Fred Hampton. I think about the history of government-sanctioned murder and their subsequent cover-ups. I think about the state of Black lives in America and know: this is not new. One year ago, my father's slaying was covered up. Today, his killer is still on NYPD's payroll. I have opened my eyes. I have studied this snapshot in time and learned that my father will never get justice. Our founding documents declared Black people property, three-fifths of the white men who used violence to enforce their will. No amendment has truly written us into humanity, and it's clear from the state of our prisons and jails that we are not yet free. I studied how people around the world threw off their oppressors, and I have yet to find a people that achieved total independence by marching and singing. I only see blood. If we're going to move forward, we need transparency. Police and elected officials cannot seriously hope to repair relationships with the community without it. Stop blocking FOIL requests. Stop the cover-ups. We're seeing right now what a difference releasing FOIL material can make, in places like Chicago. One year after the failure to indict Daniel Pantaleo for killing my father, all we want is justice. I urge us all to consider what we are fighting for. Is it reform or revolution? Which of these will bring real change? Will body cameras make a difference? Will training really stop this epidemic of police-involved killings, or will it just create better killers? Who do our elected officials really work for? More importantly, what will we do if we learn it's not the people? (3)	The convening of a new grand jury or reconvening of the original grand jury based on the applicable grounds permitted by law. On July 17, 2014, Eric Garner was killed at the hands of New York City Police Officers on Staten Island, New York. Specifically, Eric Garner's death was caused directly by the excessive, aggressive, and unjustifiable use of force in the form of a chokehold by Officer Daniel Pantaleo despite Mr. Garner's cries that he could not breath during the duration of Officer Pantaleo's chokehold. Such method of force has been banned by the New York City Police Department since 1993. On behalf of the Garner family, our grievance is derived directly from this horrific act of misconduct by law enforcement, as well as the failure of Richmond County District Attorney Daniel Donovan to uphold his obligations and duties entrusted to him under law to serve as the People's attorney and ensure equal justice under the law to the Garner family. It is our position that D.A. Donovan's conflict of interest and refusal to recuse himself from the matter was a direct cause of the grand jury's return of no bill despite the overwhelming evidence in support of Officer Pantaleo's action being the actual cause of Eric Garner's death that far surpassed the very low threshold of establishing probable cause. Although Governor Andrew Coumo's recent executive order appoints a special prosecutor to oversee and prosecute all cases involving issues of police misconduct, it remains to be clarified whether this order will merely be applied prospectively, or whether it may be interpreted to allow the reopening of previously heard cases. Based on existing New York law, there are two options the Garner family has to reopen Eric Garner's case and present it before either the original or a new grand jury. (1)	Section 190.75 of the New York Criminal Code permits the court in its discretion to authorize or direct the people to resubmit such charge that returned a no bill to the same or another grand jury. (2)	The District Attorney is authorized to convene a new grand jury around the same alleged misconduct if the legal charges are different, without seeking the court's approval. (A)	A grand jury's decision is final unless the court, in its discretion, authorizes the resubmittal of charges to the same or a new grand jury. It is our position that the original or a new grand jury should be convened to review the matter of Eric Garner's death on the grounds that the grand jury failed to give this case a complete and impartial investigation. (1)	District Attorney Donovan had a significant conflict of interest that prevented him from aggressively pursuing charges against Officer Pantaleo. (2)	It is presumed based on reports that D.A. Donovan only asked the grand jury to consider two charges: (1) manslaughter, and (2) criminal negligence. (3)	It is presumed based on reports that D.A. Donovan neglected to submit to the jury the lesser charge of reckless endangerment for consideration, which would have been more likely to secure an indictment. e)	What questions were asked of those witnesses. (5)	Current D.A. Daniel L. Master has the actual authority to convene a new grand jury around the same alleged misconduct under the new legal charge of reckless endangerment, without seeking the court's approval. b)	Aid policymakers in their efforts around criminal justice reform. (B)	In support of such efforts, Legal Aid's Criminal Defense Practice has petitioned for the Records Access Officer of the New York Civilian Complaint Review Board to provide a summary of its records regarding Officer Panatleo's history of substantiated complaints brought against him to CCRB prior to Eric Garner's death. (1)	Also included in this petition was a summary of any CCRB recommendations made to the NYPD based on such substantiated complaints. (2)	This petition was submitted under the Freedom of Information Law (FOIL), which allows members of the public to have access to records of governmental agencies, within limitations. (3)	CCRB denied Legal Aid's request, citing that New York law specifically permits government agencies to deny access to records when they are specifically exempted from disclosure by state or federal statute. (Public Officers Law § 87(2)(a)). (4)	CCRB also cited NY Civil Rights Law § 50-a(1) which provides, in summary, that all personnel records that are used to evaluate employee's performance toward continued employment or promotion are exempt from disclosure without the express authorization of the officer in question, or as mandated by court order. (5)	Legal Aid has argued that the records at issue do not constitute a "personnel record" and that the disclosure of such records is a matter of public concern and Pantaleo's privacy is not at issue. (6)	Legal Aid has received similar CCRB summaries on prior occasions up until September 2014. (7)	An Article 78 proceeding has ensued, which establishes the procedure for challenging decisions made by administrative agencies, public bodies or officers. (8)	Currently, Legal Aid is awaiting Pantaleo to perfect his appeal, which he was given 90 days to do so. If this is not done in a timely manner, Legal Aid anticipates submitting a motion to expedite. c.	Section 87(2)(f): claiming disclosure could endanger the life or safety of any person. (C)	In 2014, the former head of the CCRB, Tracy Catapano-Fox, was terminated. After filing suit for wrongful termination, the CCRB justified her termination on the grounds that she improperly disclosed CCRB records representing summaries of complaints against police officers for alleged wrongdoing. These disclosures were in response to FOIL requests, which violated both civil rights and FOI laws. (1)	Requests that Catapano-Fox produced were related, in large part, to "stop and frisk" complaints. (2)	In her lawsuit, Catapano also accuses Chairman Richard Emery of colluding with the NYPD and providing inaccurate statistics on the number of instances of "stop and frisk" by officers, and using inaccurate statistics as the basis for the CCRB's pending chokehold report. (3)	Prior to her termination, she had supplied Legal Aid, specifically, with about 62 of these records. (1)	Assuming the federal government's civil rights investigation is unsuccessful, and the legislature in Albany does not renew Gov. Coumo's executive order, what action can be taken to make Gov. Coumo's decision permanent? (2)	Can legislation similar to that of Gov. Jerry Brown of California, in which grand juries are abolished altogether in these types of cases, be introduced? (3)	What is the status of the chokehold legislation that P.A. James was sponsoring? Does she still stand in support of it? (4)	Assuming the democrats win the next D.A. race on Staten Island, is there a way we can put pressure on the next D.A. to reopen the case under a new legal charge? a)	The police union, as of September, has already endorsed Mike McMahon. How can we compel him to convene a new grand jury? (5)	Does P.A. James know about other organizations doing similar work? (6)	Can P.A. James support our position, along with the Right to Know Act? (1)	Look into the relevant statutes and law that supports the convening of a new, or the original, grand jury. (2)	Take a public stand in support of Garner Way Foundation's efforts to convene a new grand jury and be a dependable source, and resource, to the coalition that is in progress. (3)	Point us to other organizations and individuals that are engaged in efforts that will complement what GWF is doing. (4)	Outreach to the local US Attorney's office to put pressure on continuing the federal civil rights investigation. (5)	Review the lawsuit related to the release of Pantaleo's CCRB records and see where she can apply pressure to expedite the appeal. (6)	Applying pressure, where appropriate, to release the grand jury minutes. 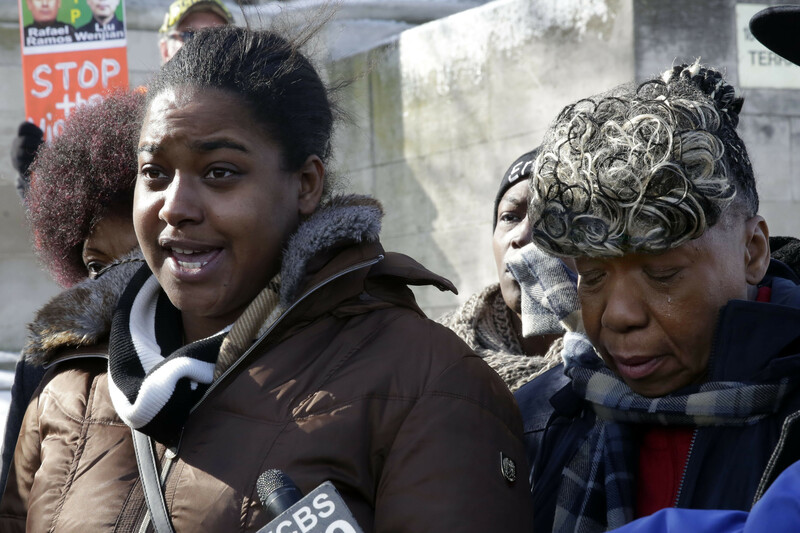 As a final note, Erica Garner met with P.A. James on Friday, October 23, 2015 to generate P.A. James' support in GWF's efforts, seek public support on achieving justice for the Garner family, and identify opportunities to connect with other organizations and individuals doing similar work. •	In response to questions related to the status of the Department of Justice's (DOJ) investigation, P.A. James agreed to inquire into the DOJ to check on the status and put pressure on them to expedite the investigation. •	Although there might be limitations in P.A. James' ability to influence the City in resolving the matter of the withheld CCRB records due to her office's lack of standing, her office will look into the degree to which they can assist in this area. •	P.A. James expressed P.A. James expressed that she will have a conversation with new D.A.-elect Mike McMahon in an attempt to get him to convene a new grand jury based on a new legal charge (presumably, reckless endangerment). •	With regard to the proposed chokehold legislation and the Right to Know Act, P.A. James remains in strong support, however, has not had enough sponsors--the bill is at a standstill. •	With one of GWF's interests being to pull resources together and have a unified voice and objective, it was suggested that GWF work to convene a one to two day conference, to bring likeminded individuals and organizations to the table and build a coalition.